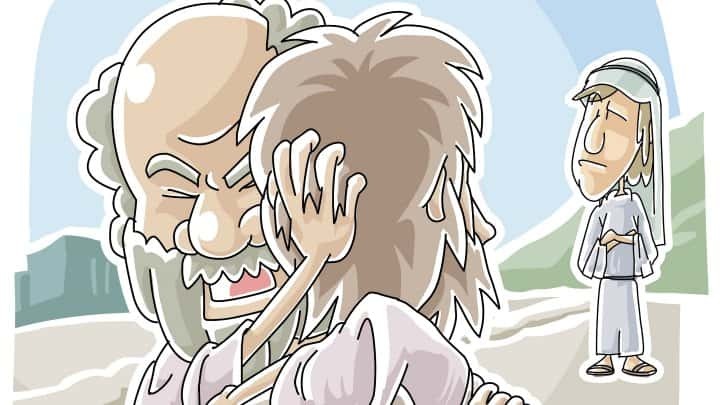 Kids love story time…and fortunately, God loves it, too, if we gauge by the many parables Jesus told throughout His ministry (more than forty of them!). Usually, these lessons were given to explain difficult principles or communicate messages of faith. Often, not everyone understood what Christ was describing…but just as those who often scoffed turned away, Jesus showed through His life that He cared for ALL people, and came especially for the sinners that needed Him most. In the parables of the lost sheep, coin, and son, kid will see how God loves each of us more than we can imagine. Nothing can separate us from that Love. Lesson focus: Even when we make mistakes and run away from God, He still loves us and welcomes us back into His grace. “Baa baa…who’s there?” Jesus said, as the Good Shepherd, that His sheep know His voice. Test your skills with this game. One “shepherd” wears a blindfold and walks around the other kids in a circle, Marco Polo-style. When the shepherd lands on a sheep, he/she will make a “baa” sheep sound and the blindfolded shepherd must guess who it is. If he/she guesses correctly, that sheep becomes the next shepherd. If not, move on to another sheep. Find the lost sheep…before class, hide cotton balls all over the classroom and have the children hunt for them. For an extra variation, make one cotton ball extra special (colored or marked somehow) and hide it in a particularly difficult spot. If not found in the initial search, instruct students to look from top to bottom until it is located. Get the sheep in the pasture…Have a bowl full of cotton balls on one side of the room, and an empty bowl at the other side. Students will use clothespins or chopsticks to move the cotton balls from one bowl to the other. If dropped, they must go back and start over. *Variations: have a line or relay pass cotton balls along with clothespins. Or for extra excitement (and mess) use popsicle sticks or noses(!) coated with Vaseline. Stick a cotton ball on the Vaseline to transport across. After a game or two, gather students together to begin the lesson, explaining that we are going to talk about special stories and examples Jesus used to help people understand His truths. Here, Jesus uses something quite familiar to first-century Jews: sheep. Sheep are not too bright and prone to wander away. A shepherd, tasked with guarding his flock, would know where each sheep was and would make sure they were safe. It seems strange to leave 99 sheep just for one little reckless lamb. But in this parable as well as the following (that of the lost coin and the prodigal son), Jesus is emphasizing how much God loves us. Give each student one grain of rice. Have them look at it, and then hold up a cup full of rice. Explain that if each grain was one person, it would take more than ten cups full of rice just to show the number of people living in your city! (*Note: this number will be different according to city population. A cup of rice is estimated to have roughly 8-10,000 grains depending on variety. Feel free to come up with math for school/city/etc.) Imagine how much more for the country. And now think of the whole world…that is a LOT of people and each of us is just one itty bitty speck. But God knows us by name and cares for each little grain of rice more than we can imagine. Ask students if they have any collections or clusters of favorite things (dolls, cars, etc.). If one went missing suddenly, would they notice or care? Would they try to find it? God feels for us so much more than we can ever care for a trinket or toy. And He is delighted when we come to Him. Close with prayer and reminder of God’s work in our lives. Thank God for loving us and ask for help in hearing His voice and following Him. Tony Kummer (Editor) reviewed & updated this page on : March 29, 2016 at 9:30 am. All our content is peer reviewed by our readers, simply leave a comment on any post suggest an update.